Cummins has developed a unique suite of innovations to improve the performance and efficiency of heavy-duty commercial wastegated turbochargers. Using advanced computer modeling and real-world lab testing, the new approach has resulted in improvements in turbocharger efficiency of up to 6% and fuel efficiency of 1.5%. The work has included development of a highly optimized mixed flow turbine stage and a revolutionary turbine exit diffuser design with wastegate flow control, and optimization of the compressor stage. The new mixed flow turbine developed by the company has the characteristics of both an axial and a radial machine, providing a better match to the compressor so that the peak efficiency of the turbine moves closer to where the peak efficiency of the compressor is when operating on an engine. “We have also considered the effects of pulsation on the turbine and how that can be used to improve turbocharger efficiency,” explains Archer. Furthermore, optimization of the turbine diffuser through analysis-led design has enabled improved turbocharger performance as well as reduced back pressure on the engine. “If we are able to design the exit well we can improve turbine efficiency so stage efficiency is improved,” Archer says. The new innovations developed by Cummins have been detailed in a research paper entitled Advances in heavy duty commercial diesel wastegated turbocharger performance to deliver improved engine efficiency. 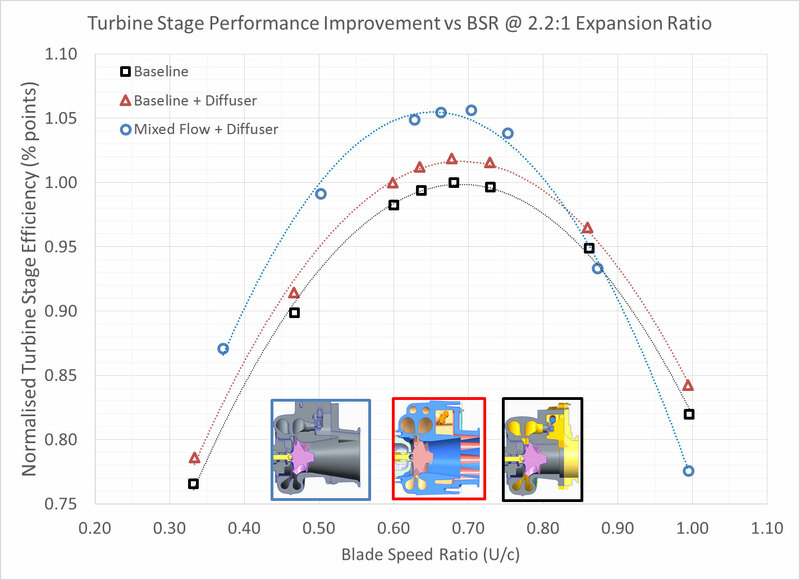 The graph shows the final comparison between the baseline radial turbine stage, the baseline with a diffuser and the mixed flow turbine stage. In this case all the turbine stages have a similar flow target and the inlet diameter is the same for both the radial and mixed flow turbines. The graph also shows the outline geometries for each stage for comparison. As can be seen from the plot the mixed flow turbine stage with diffuser is more than +5% points better in peak efficiency than the radial turbine stage. For more information contact cummins@grayling.com.